“You should know that he is not a quitter. Dumoulin had been a strong rival and it was unexpected but we never thought the race was lost." 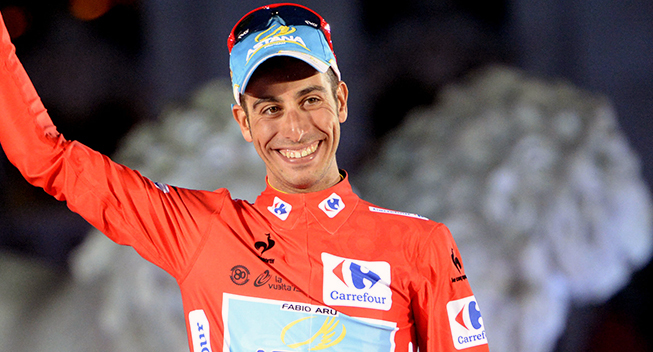 The man who takes care of the muscles and soul of Fabio Aru is Umberto Inselvini. Having worked alongside many champions, the 57-year old Italian has won the confidence of the promising Sardinian who gained international prominence by winning the Vuelta a España. Unsurprisingly, he was overjoyed to watch his protégé on the top step of the podium in Madrid. "At that moment, I was crying and it is nothing to be ashamed by,” he tells Tuttobiciweb in an interview. “If he can touch people in this way, it means that he has done something that goes beyond the victory in a bike race. "When Dumoulin led, Fabio wanted to do everything possible to get those 3 seconds back and take the jersey. The last three stages were very intense because they presented the last chance to turn the tables. He did it in the last road stage. The next day he had not realized what he had done. We did not say anything after the finish, we both knew what the team had done to get this victory. It was enough to look into his eyes to understand that he made it. Inselvini also explained how Aru behaves on the massage table. "He is a very polite boy,” he said. “To find a young man who always asks for permission says ‘please, sorry, thank you’ is not so common. I appreciate it in this way because I like him. He pays attention to the small things. He is very respectful of my work. He looks at the messages he receives on the phone, relaxes and does not have particular habits. I also know that there is a time when you can talk but sometimes you have to listen, it depends. There is no fixed routine. Themassage changes according to how tired he is. “The thing that surprised me most is the ease with which he faced the time trial: we were all tense because we knew that that day could decide the Vuelta, while he was calm because he was aware that he had done the most to get to the top for the decisive challenge. "I met him for the first time ever in Livigno in 2011. I was on a training camp with Cunego and Ballan at Hotel Valtellina and Fabio was in our same hotel alone. He had just turned pro at Astana and he seemed to be a little reserved, probablu because he was impressed to be with more accomplished riders. On that occasion we did not speak either, so my first impression was just superficial. I did not know that we lived close to each other, both in Bergamo, because we had never met before. We started to work together in 2013. "Since then he has grown because he wanted to grow up. he has always tried to improve. For example, he has focused on nutrition, trying to understand what he can eat and what has bothered him and made every effort to be at his best. He gives the most to achieve what he wants to do and sacrifices a lot for this. Despite only three years of professional experience, he has done more than some riders do during their entire career. The pressure has obviously increased. This is the first year that he is not only the leader of a team but also of a stage race. It cannot be easy for a 25 -year-old rider but he is mature and can handle the responsibility.